Nyiragongo volcano trek isn’t for everybody: grueling 5 to 8-hour hike takes you to the active lava lake, which boils like a gigantic atlas of doom, making you second guess your existence. It’s a hassle to organize visas to the DRC and permits to hike the enigmatic Mount Nyiragongo, and security situation in Virunga National Park is flickering. 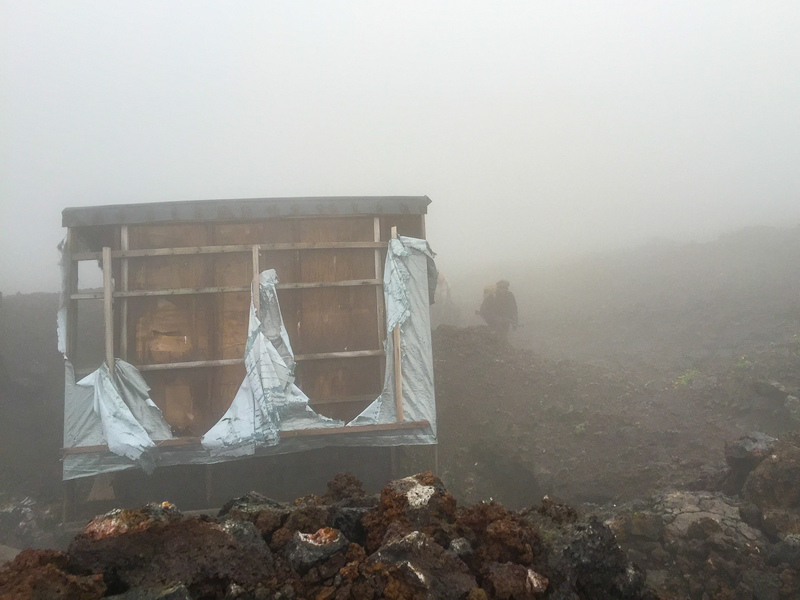 Weather at the Nyiragongo summit is hostile, cold, and damp; accommodation is rundown and you have to carry everything you will eat and drink. But nothing beats the magical feeling when you’re finally standing at the edge of Nyiragongo Crater, heart racing and hands shaking, staring down to the fire-spitting lava lake, which glows red in the pitch-black darkness. Years ago, I stumbled upon a jaw-dropping image: a tiny tent glowing at the volcano rim, just above a viciously fire-breathing lava lake. It looked insane, but at the same time, I felt a flash of pure beauty. The caption declared that this out-of-this-world volcano called Mount Nyiragongo lies in the Democratic Republic of Congo. It set off my alarm bells, but soon the only thing I felt was a compulsive beat banging against every cell of me: I must climb Mount Nyiragongo, although minutes ago I hadn’t known that this surreal boiling volcano even existed. Quenching the thirst of adventure didn’t come easily. After some manic googling we found out that it really is possible to visit the Congo DR nowadays, though it’s not advisable according to most countries, such as the USA or our own. The dream was soon eluded, but not forgotten. 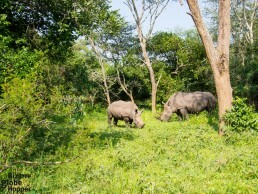 When roaming Uganda and Rwanda, we caught ourselves gazing dreamily over the border of Congo DR. It was so close, yet so unattainable. We decided to do everything we possibly could to cross the Congolese border and complete the crazy Nyiragongo volcano trek. Well, we eventually did cross the border, and it wasn’t too smooth, but that’s a whole another story – including bribes at the border. Lesson learned: if you are planning Nyiragongo Volcano trek, contact Congolese travel agencies. They will organize your visas and Nyiragongo hiking permits at a very reasonable cost. Check the current security situation in Virunga National Park and Goma area before booking your Nyiragongo trek. Because of the various tragic incidents that have happened in Virunga in 2017-2018, Virunga National Park authorities decided to close Virunga from tourists in 2018. 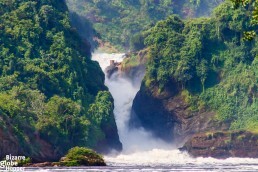 Luckily, Virunga National Park was re-opened in February 2019. 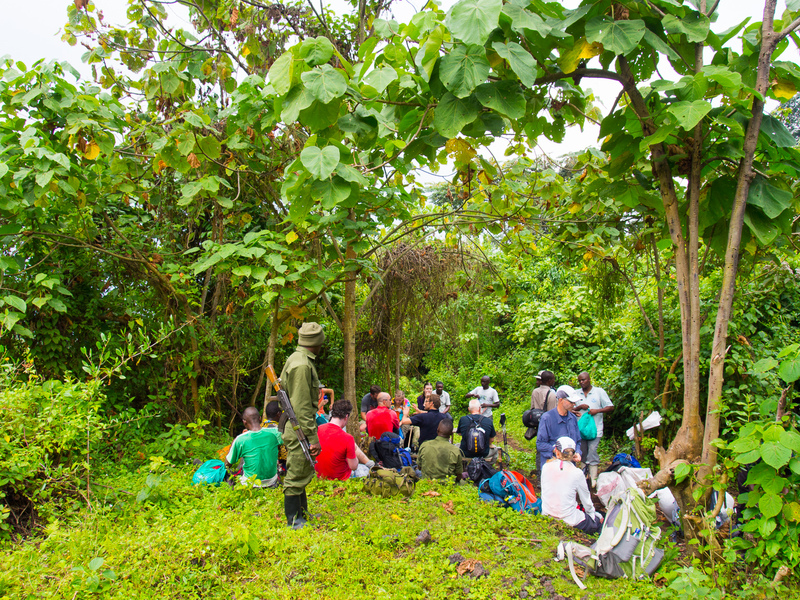 Nyiragongo treks and gorilla treks in Virunga are operational again. 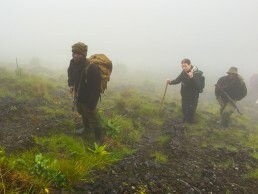 Virunga National Park authorities claim that the security situation near Nyiragongo volcano has improved radically so that they can guarantee the security of Nyiragongo treks. If you’re planning Nyiragongo hike, you’ll probably like to how horrible and awesome it will be. That’s why I’ll recap our experience below from start to finish, with some practical tips like how to avoid acute mountain sickness. If you’re still more interested in the practicalities, feel free to jump to the planning sections to draft your own Nyiragongo packing list. 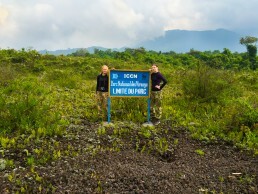 Our Mount Nyiragongo hiking day dawned finally after an exciting night and day spent in the Congolese border town Goma. 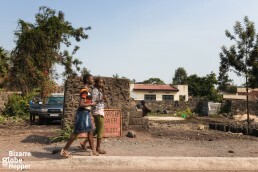 Our tour operator picked us up and off we drove through the borderland of Goma, noticing how literally this town lies in the shadow of Mount Nyiragongo volcano. During the 20-kilometer ride, we saw how the recent Nyirangongo eruptions had destroyed life, but in the middle of the debris and collapsed houses there were still laughter and hope. 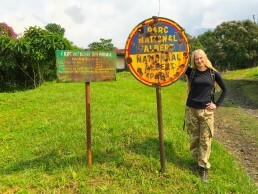 After a while, rusty and bullet-ridden signs welcomed us to Virunga, the oldest national park in Africa. Conveniently located at the trailhead of Nyiragongo volcano, Kibati ranger station is the starting point for all Nyiragongo volcano treks. 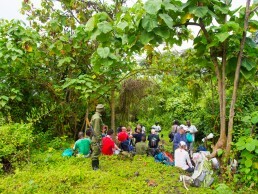 At Kibati, we were greeted by a group of muddy hikers returning from the summit. They seemed tired, but grinned blissfully and couldn’t stop extolling the Nyiragongo adventure, pumping our adrenaline levels even higher. 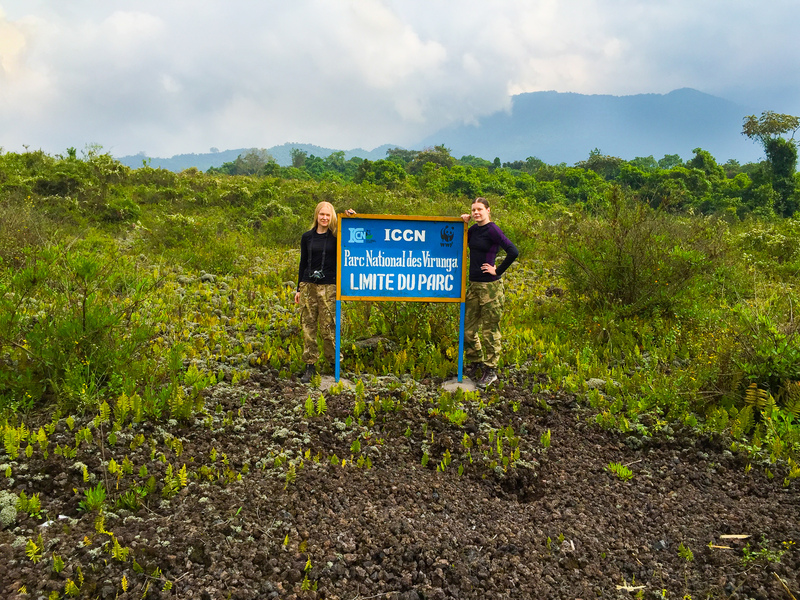 After signing the papers (yes, the risk was our own), we got a short briefing from the park rangers and were finally ready for our Mount Nyiragongo trek! 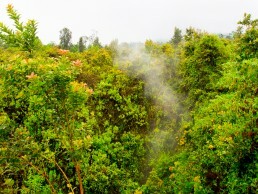 A pleasant rainforest accompanied us through the lower slopes of Nyiragongo. Monkeys, chimpanzees, bushbucks and even gorillas habituate these lands, but we saw only some birds and ants. The latter were my enemies – they made me jump over their paths and almost run a couple of hundred meters just to make sure that I didn’t get any unwanted travel companions. Even though rangers hype the possibility of seeing chimpanzees and gorillas during Nyiragongo hike, those diamond sightings are reserved for separately chargeable gorilla and chimp treks. We did gorilla trekking in Uganda: if you haven’t done it before, consider adding it to your trip, as Virunga is the most affordable place to track gorillas. 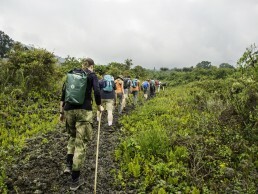 Check our gorilla trekking experience for inspiration! The first break on our Nyiragongo trek was well deserved after an hour of hard work. 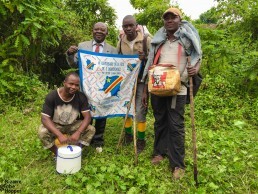 Armed rangers patrolled at both ends of the path while we celebrated our first triumph with some homemade Congolese cookies. We tackled the first leg of Nyiragongo volcano hike in almost 30 minutes before the usual schedule, which made our rangers proud, but ourselves a bit worried. Whereas the Nyiragongo climb begins at 1989 meters, it ends 4-8 hours later in the whopping 3470 meters, so the ascend is quick and steep. Since deciding to hike Mount Nyiragongo, I had been anxious about the acute mountain sickness (AMS), from which I suffered in Cuzco a couple of years ago. The best way to prevent the AMS is to climb slowly and stay hydrated. Luckily this time both of us were unaffected. Our brisk start came with a price, though. A few members of our group started to stumble over, and some were almost at the verge of giving up their dreams of conquering Nyiragongo. 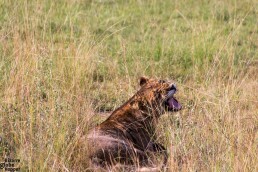 Our guide, Tresor, made a great job convincing the rangers to slow down before anyone was injured. In the end, hiking a mountain is certainly not a competition! Just after the first break, the scenery changed radically, as the lava fields of Nyiragongo spread before us. I was surprised that the lava below our feet was from the 2002 eruption. Somehow the rugged landscape reminded me of Finnish Lapland. Scrambling on the lava gravel wasn’t easy and ascend was unmercifully steep. I praised our walking sticks dearly – you definitely need one to survive! Falling might be dangerous, as the volcanic gravel is ruthlessly sharp and spiky. We had felt tired already after the first leg of our Nyiragongo trek, but the stunning views towards the neighboring volcano loaded up our energies again. Fortunately, the breaks started to pour in faster, in about 30-45 minutes intervals. The next affliction came out of the blue, though. Just after grabbing our sandwiches at the second break, the cloudburst began. We were hoping for just a quick shower, but torrential downpour became our companion for the next hours, making the last legs of our Nyiragongo hike even harder. During the rainy season, it’s impossible to avoid getting wet, but the dry season was almost here. We just had just bad luck. The slope of Nyiragongo was getting even steeper, and the thinning air made us gasp. Rain blurred our vision, leaving open just ten meters around us. We stopped briefly at the fissure from where the lava of Nyiragongo had burst all the way to Goma, creating massive channels. The volcano was breathing in heavy fumes through smaller fissures, reminding that it’s still alive. Die-hard trudging in the middle of thick smog and drizzle brought us to a new rainforest, which had grown upon the lava fields from the 1977 Mt Nyiragongo eruption. First, the loose lava surface turned into slippery mud. Then the desirable shelter was ripped off, again. 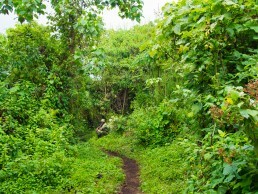 We continued to struggle our way through barren lava fields. My fingers were so frozen that it started to feel like our dearest Lapland, in the arctic circle of Finland. Congo DR took us by surprise: our waterproof gear was already soaked. Torrential rains forced us to cancel one of the official breaks on the Nyiragongo hike, so the final rest stop was already above the clouds. At last, we could see the peak of Nyiragongo volcano upon us. But the climb seemed disheartening: the ascension looked like 45 degrees. 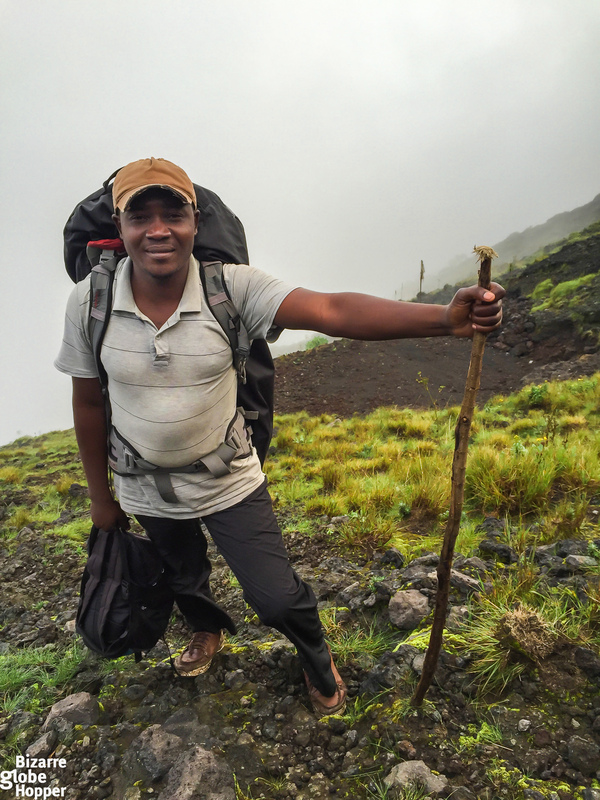 Our jovial guide Tresor raised the spirits by telling that the Nyiragongo summit was just 200 meters upon us. It was a tough struggle, though. The volcanic gravel was so loose that it brought down several members of our group. The final leg took only half an hour. Nevertheless, it was the hardest part of our Nyiragongo hike, with already tired muscles. The Nyiragongo volcano summit was in the clouds when we arrived. 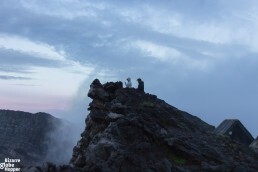 I had heard that some trekkers don’t even see the lava lake, which made me nervous. Tresor comforted me by telling that the sky usually clears up after heavy rain. Suddenly, our wet gear brought us luck! 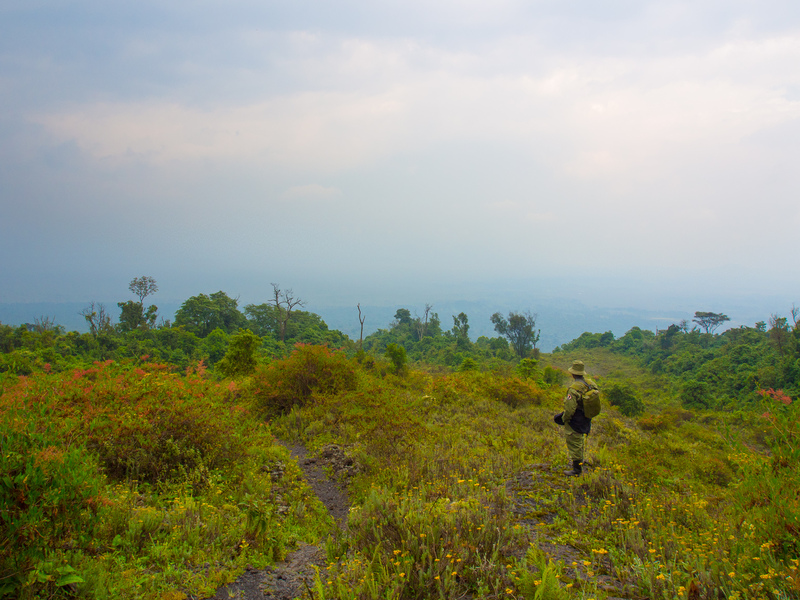 As we changed clothes, the landscape started to brighten up, and in one hour we could see all the way to Goma! We couldn’t have hoped for a better prize after the exhausting volcano climb, yet this was just an appetizer. 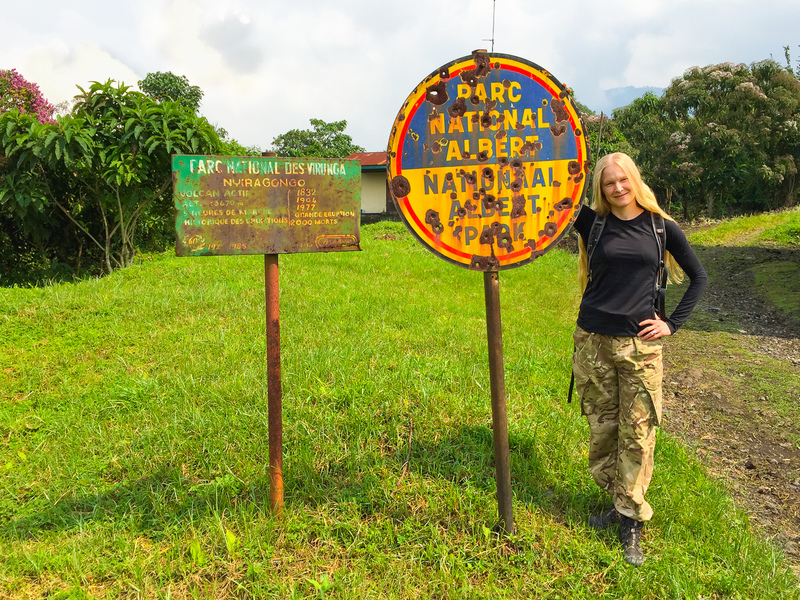 I was pretty terrified from the moment we acquired our Congolese visas throughout the Nyiragongo trek. However, once we reached the volcano peak, I somehow calmed down. 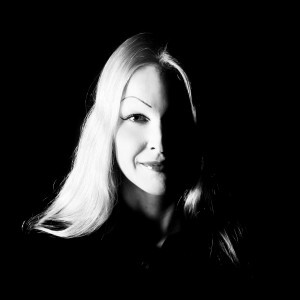 I was waiting for heavy smells and fumes, which feel suffocating to me since I have a chronic lung disease. When we visited Masaya volcano in Nicaragua, not even healthy persons were allowed to stay at the edge of the smoking caldera more than 5 minutes. Luckily, it’s a different deal at Mount Nyiragongo. There’s just a light smell of sulfur hanging in the air. It’s not more than you would feel near a swamp, and much less than we have encountered in the volcanic areas of Nicaragua or Iceland. Since breathing was easy even for me, a healthy person won’t feel any inconvenience. But of course, the altitude makes you breathless, also hindering the last part of the climb. Are you ready to face the heart of darkness, the mouth of Hell? Mount Nyiragongo has been awarded with many nicknames and overnighting above the world’s biggest lava lake is a nerve-wracking idea. 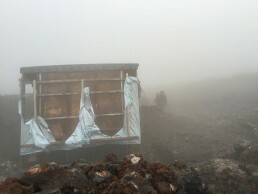 The Nyiragongo summit camp lies a bit below the highest point of Mount Nyiragongo. So when you’d like to peek at the blazing lava lake, you’d need to climb to the volcano rim with a ranger or your guide. I suggest witnessing the lava show both at the twilight and right after the darkness has fallen because lightning affects the atmosphere drastically. 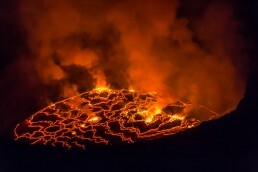 During the night, the Nyiragongo lava lake is usually more visible. We were incredibly lucky because at the time of our visit the Nyiragongo crater was fully “open” like locals say, meaning that clouds and fumes didn’t cover the view at all. The boiling lava of Nyiragongo crater lake forms beautiful, constantly changing compositions. It looks like a world map, where the countries are exploding and re-forming right under your eyes. Gazing at the fiery lava lake after the nightfall was something I won’t ever forget, though I was shivering from both coldness and fear. Here you can read more about the Nyiragongo lava lake and our experience there! Watching the crater lake at the rim is safe, but of course, you need to be careful not to fall. There’s a small cross memorating one Chinese trekker who lost her life here. Crater walls have visible layers, or lava benches if you wish, from the past eruptions. If Mount Nyiragongo chooses to erupt again, the lava flow could run even 100 km/h, since the lava is exceptionally fluid. So you wouldn’t make it very far. It’s a disturbing idea, but then again, it didn’t stop us from fulfilling our dream – and I’m still ecstatic about it! 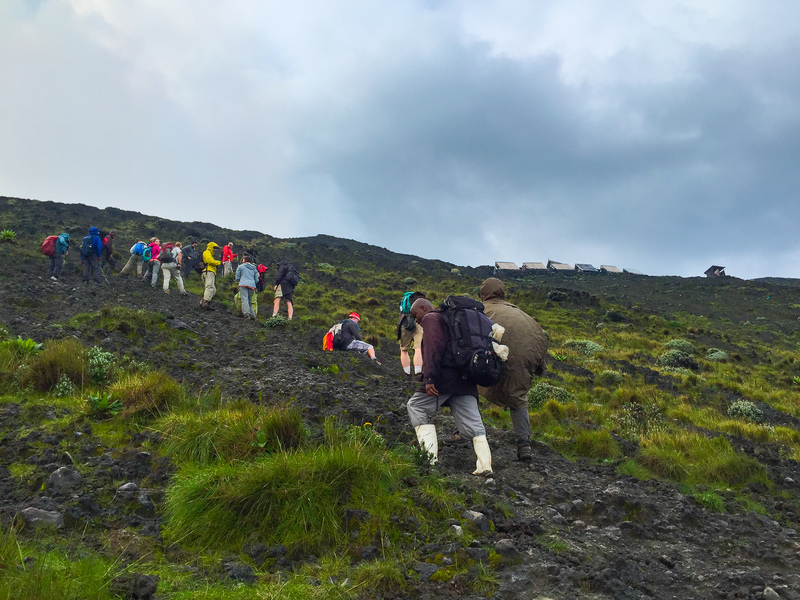 The inhospitable conditions at the Nyiragongo summit bring you firmly back to reality. You have to be prepared for the severe weather and very basic accommodation. 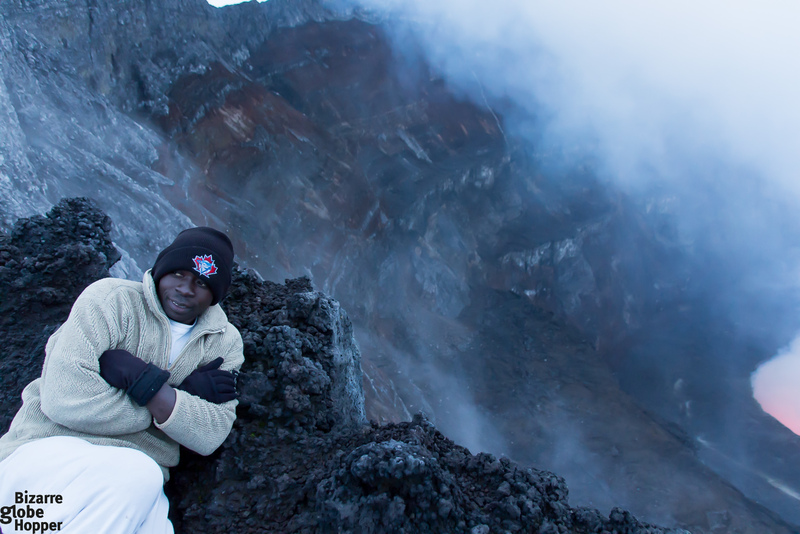 The scarcely vegetated Nyiragongo summit might even be snow-capped, and the winds are harsh. There are eight tents inside small, wooden huts, meaning accommodation capacity for just 16 people. In fact, you can’t really call them tents or cottages. There are just wooden platforms with roof and walls; most of the windows and doors are broken. Inside you’ll find a loosely hanging canvas upon two mattresses. It’s a shelter providing some shade from the harsh climate, but you definitely need to have enough warm layers to survive. To add some challenges, both our tent and sleeping bags were wet when we arrived. Of course, also our so-called waterproof shoes were soaking and base layers all sweaty. Luckily, we managed to dry one of the sleeping bags at the campfire and used it as a shared blanket. We drank around ten cups of tea and took some soothing herbs to support sleep. I felt shivery in our tent, but finally, tiredness took over, and I managed to get a few hours’ sleep. The cottages at the top of Mt Nyiragongo are scattered at two narrow strips of even ground. It’s a steep trudge up and down. Thus visiting a toilet at the Nyiragongo summit is not for faint-hearted. You have to hang on tightly to the rope as you descend an extremely steep slope. Be careful not to fall as lava gravel flows under your shoes. In the outhouse, you will be rewarded with a panoramic view reaching even the lights of Goma. Is It Safe to Climb Nyiragongo Volcano and Stay by the Lava Lake? You can’t escape the fact that Mount Nyiragongo is one of the world’s most active volcanoes. So is it really safe to climb an active volcano? I would say yes, but the truth is that you never know. Walking around independently might be dangerous since the volcanic area has fractures emitting gas, but locals know how to avoid them. Goma has its own seismologic observatory monitoring both Nyiragongo and its sister volcano, Nyamuragira, which is titled the most active volcano in Africa. Volcanologists should know well in advance what these giants are up to. However, due to poor funding, their resources are lacking, and the last time Nyamuragira erupted in 2010, it didn’t even give any sign. Some volcanologists claim that during the last eruption of Nyiragongo in 2002, the fracture reached all the way to Goma. That would mean that the next time eruption might start in Goma! 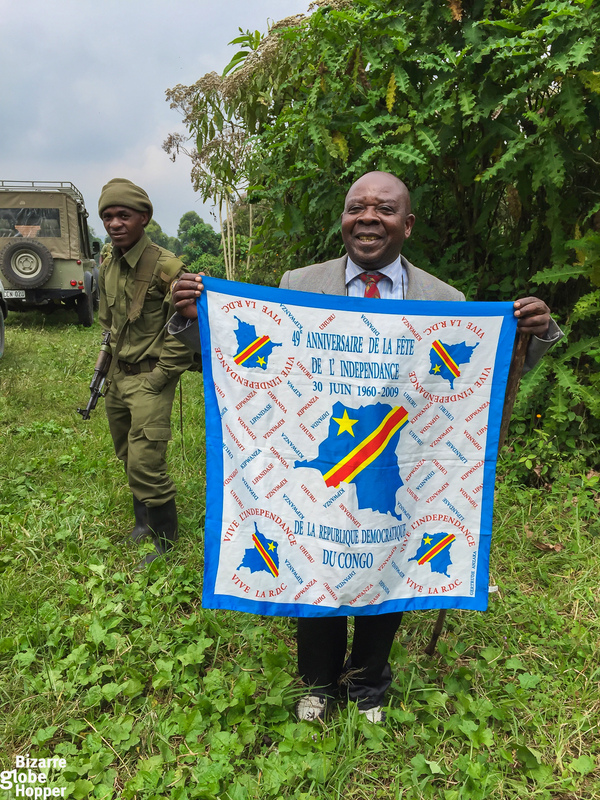 Before entering the Democratic Republic of the Congo, check the current security situation. 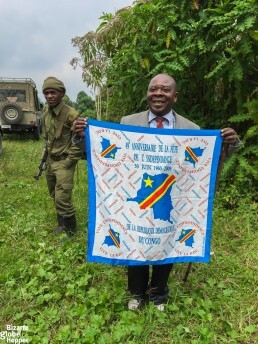 The guerrillas roam in the Virunga area since it has been the battleground for the army of DRC and different armed groups, such as the FDLR (the remnants of Rwandan Hutu rebels), for some 20 years now. Every hiking group heading to Nyiragongo volcano will have two armed rangers. We had even three, which made us wonder if the hike was more dangerous at that time. When some tourists were left behind during the climb, our rangers seemingly panicked and couldn’t even hide their reactions. So there might be real dangers hiding in the bushes, although we felt completely safe during our Nyiragongo trek. 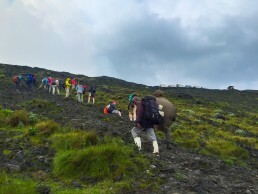 Several Congolese tour operators can organize the Nyiragongo volcano trek, and it’s also possible to book it independently from the Virunga National Park. 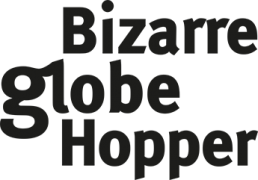 We would suggest picking a local tour operator listed in visitvirunga.org, the official tourism site of the Virunga National Park. We booked our Nyiragongo trek through Kasitu Eco Tours. They were able to get our Congolese visas in a just one day instead of the officially required seven days. Our tour cost 500$ per person, including the visa (100$), the national park fee (250$), all transports, private guide, an excellent cook at the Nyiragongo summit, and all the food and drinks during the hike. Kasitu Eco Tours picked us up from Gisenyi, the border town on the Rwandan side, and helped us through the border of DRC (we wouldn’t have been able to cross the border without their help and bribing the officials). Our guide Tresor was both enthusiastic and informative; an excellent travel companion in every sense. Whenever we stopped to take a breath, he conjured up different sweet or salty snacks. We were surprised by the quality of the food at the Nyiragongo summit: our dinner and breakfast at the mountain were so much better than most of the meals in fancy hotels of Uganda. The starter salad was actually among the best we’ve ever had in Africa. And it was cooked over a campfire at sweeping 3470 meters! Book your Nyiragongo hike well in advance. Only one group can hike to the Nyiragongo summit daily, and the group size is limited to 16 persons, due to the accommodation capacity. During June and July, the Nyiragongo treks can be fully booked. You must arrive at the Kibati ranger station before 9 AM; the Nyiragongo trek starts around 9.30-10 AM. If you’re late, you’re simply not allowed to hike and won’t get a refund from trekking permit. The Nyiragongo climb takes 4-8 hours depending on the weather conditions and overall fit of the group. It is possible to conquer Mt Nyiragongo also on a day trip, but it will be a long and very challenging day: we can only recommend an overnight hike. Reaching the summit can take up to 12 hours if you’re in a slow group and weather is poor. Porters can be hired at the Kibati ranger post for 25$, and I strongly recommend taking one to save your energies. We had one porter for two of us carrying a shared backpack and of course our waters and meals. The maximum weight for one porter is 15 kg. 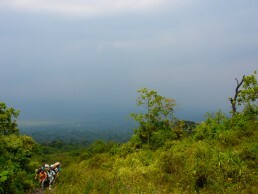 Nyiragongo trek is relatively easy but tough. 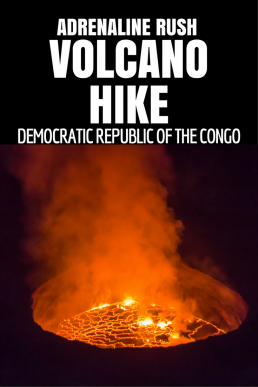 That means you can hike Nyiragongo without any pre-training, even though you might not be fit. There were young and old people in our hiking group and most people made it all the way to the top. It’s more mental than physical struggle: you just need to continue even though you might feel too tired to walk, rain limits your visibility, and loose rocks are slippery. Take a walking stick. It’s essential to survive the uneven slopes without constantly falling down. Did I already mention that falling down might be dangerous? Know the risks. Check the security situation before you go. Avoid acute mountain sickness (AMS) by hiking slowly. The hiking group is usually divided into two: the other group climbs faster and another takes it slowly. Depending on the group, the hike could take up to 12 hours. Listen to yourself and choose your own pace. You can also prevent AMS by taking pills. Don’t take your drone. Nyiragongo is called a drone graveyard for a reason: flying a drone upon an active lava lake will destroy your toy. If possible, avoid the high season and weekends to get a smaller hiking group. Take only the gear that you will need. Left your heavy luggage to the storage room or to your tour operator. Park rangers lead the hike even if you have booked the trip through a tour company. As we booked through a travel agency, we had our own guide, porter, and cook. The cost wasn’t much higher, so we highly recommend booking through an agency. 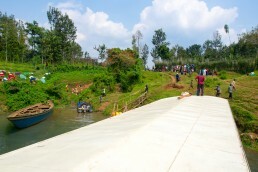 The company helps you to cross the Congolese border smoothly and you’ll get many extra perks during the hike. Pack enough warm layers and rent a sleeping bag: check the packing list below for other hiking essentials. Warm layers: long underwear, enough warm socks, gloves, fleece or woolen shirt, a set of clothes. When finally reaching the Nyiragongo summit, you’ll need to change a dry base layer immediately. Don’t underestimate the conditions, as the temperature at the summit might be near freezing and the risk of hypothermia is real. Sleeping bag: Included in most packages, but if you don’t have a sleeping bag, you can rent one for 7$. Lots of water: staying hydrated prevents AMS. Please note that without a meal plan you need to carry loads of drinking water, as there’s no water source at Nyiragongo. If you pay for the meals, your porter carries enough water for you. Food: If you don’t have a cook with you, bring enough food for a filling dinner. A hot 3-course meal can really make the day after an exhausting trek. So consider hiring either a chef or cooking utensils. I’d suggest selecting the meal plan, which covers dinner, breakfast and ample snacks during the hike. Final Conclusion: Is Nyiragongo Hike Worth the Price and Effort? 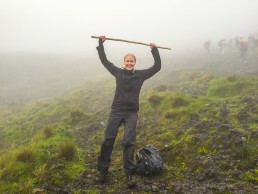 Despite the steep prize and rough climb, we were extremely content with our Nyiragongo trek. Not everyone in our group agreed, though. Some felt that the tough trek and conditions were too much to bear. If you think that $500 is too high price for an overnight trek, think twice. The package price includes a visa to the DRC ($100), Nyiragongo hiking permit and Virunga national park fee ($250), all food and water during the trek (carried for you), private chef at the summit, a sleeping bag and walking stick, plentiful snacks, all transports (from Rwandan side to Goma and from Goma to Virunga National Park), and a private guide who will enrich your Nyiragongo experience (we loved our guide Tresor and still talk to him frequently). If you are moderately fit and can handle camping at the cold temperature for one night, the unreal sceneries of Nyiragongo crater lake will bewitch you for good. The prize of Nyiragongo trek is witnessing the boiling lava lake at the top – it was one of the undisputed highlights of our one-month tour in Uganda, Rwanda, and Congo DR.
Mount Nyiragongo is amazing, it’s a must hike! 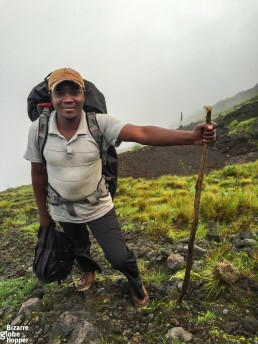 I didn’t know it was possible to trek Nyiragongo. This is an impressive experience. I will consider doing it next time I go to Uganda, which was one of my favorite countries in Africa. I also didn’t know it was the biggest lava lake… I trekked Erta Ale in the Danakil Depression in Ethiopia and will do it again in December, which is I believe the oldest lava lake (everything has some superlative of a kind). Did you also go Gorilla Trekking? Hello Gilles! Nyiragongo has been open for trekking for about a year now. I would highly recommend the trek, although you’ve already experienced something similar. As Virunga is the oldest national park in Africa, you’ll get even one more superlative with this trek! Erta Ale looks absolutely stunning, too! Ethiopia is on the top of our list already and now we have one more reason to go there. We did gorilla trekking in Bwindi Impenetrable Forest in Uganda and are going to publish a video about it during the next week.  An article is also on its way. Happy travels!